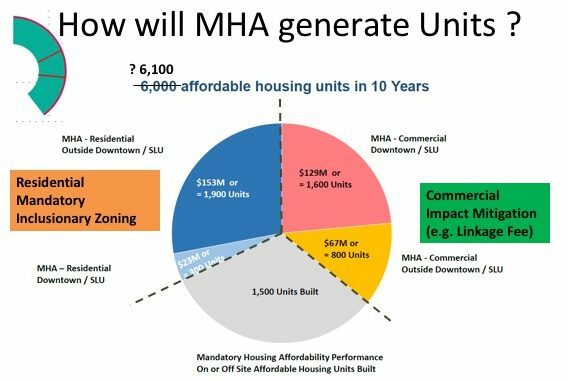 Seattle has proposed that all new multi-family and commercial development either set aside a percentage of units to be affordable or contribute toward a fund to build affordable units elsewhere. Major developers have sued to stop similar programs in other cities, but under the “Grand Bargain” some of the major developers and housing advocates have agreed not cooperate (e.g. 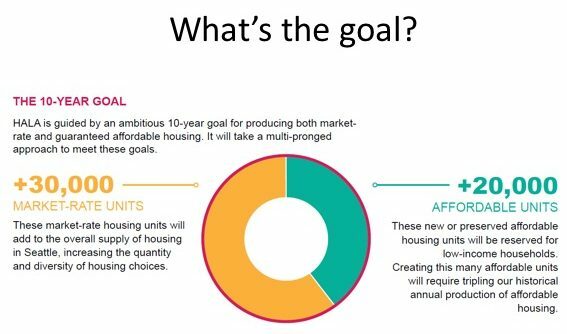 not sue) if the percentage of units set aside is limited to 5-7%, development capacity increases, and other various principles set out in the bargain are followed. 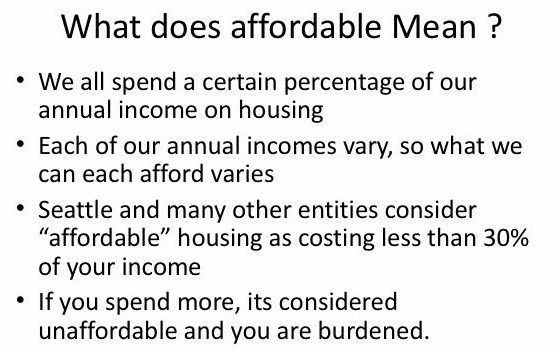 For example, a single person making 60% of the area median income (AMI) makes $37,980. 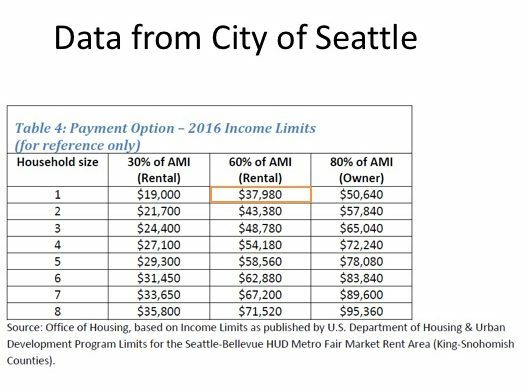 For a one-person rental to be considered affordable, rent would be no more than approximately one third of that person’s monthly income, or $1017 per month. 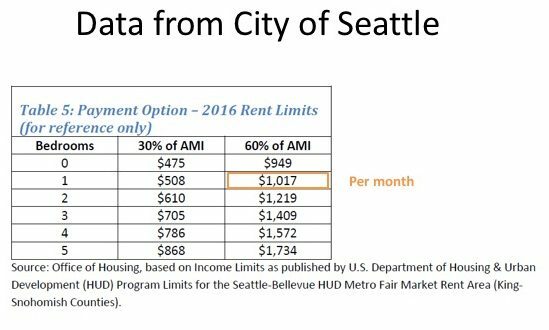 It is difficult to find housing at these rates today, and as more people move to Seattle competing for limited housing supply the pressure (or opportunity for landlords) to raise rental rates will and has increased. 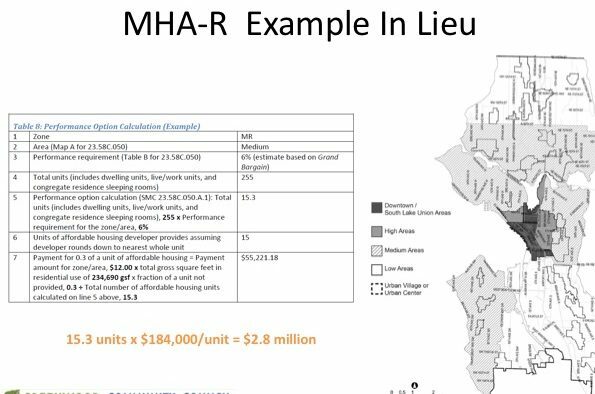 Over the past decade there has been significant displacement of low income people and ethnic minority families from Seattle to more affordable housing in distant car-dependent suburbs. HALA has summarized the need in their studies. 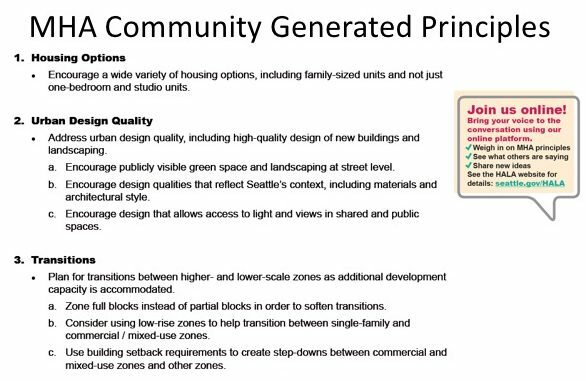 Seattle’s goal is to provide 50,000 new housing units over the next 10 years of which 30,000 would sell or rent for market rates. 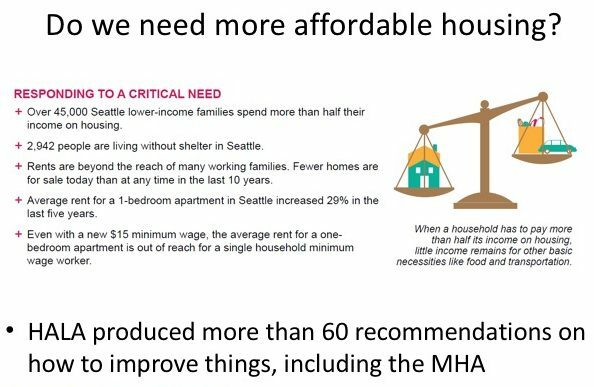 Public housing would provide about 14,000 affordable units through Seattle’s housing levy plus federal, state and non-profit housing programs. 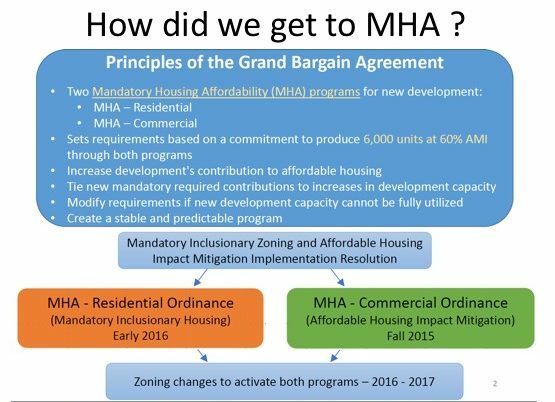 The remaining 6,000 affordable units would be achieved through the Mandatory Housing Affordability (MHA) program. 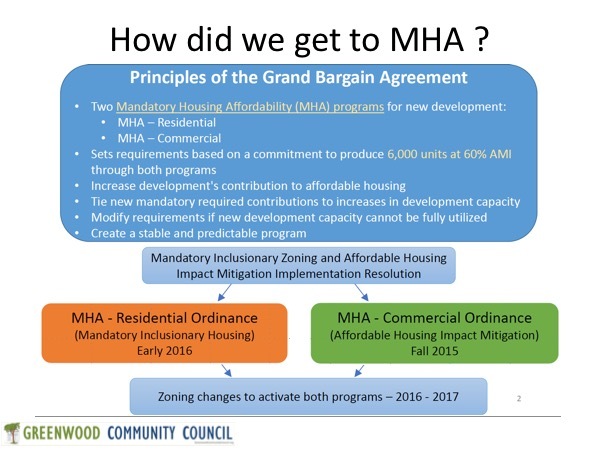 Key point: Under the grand bargain, “major players” have agreed not to cooperate with the MHA program as long as the program is limited to 5-7% of all units, and multifamily housing zoning rules are changed in designated urban villages throughout the city to allow an additional 10′ (or one floor) of height, amongst other principles. 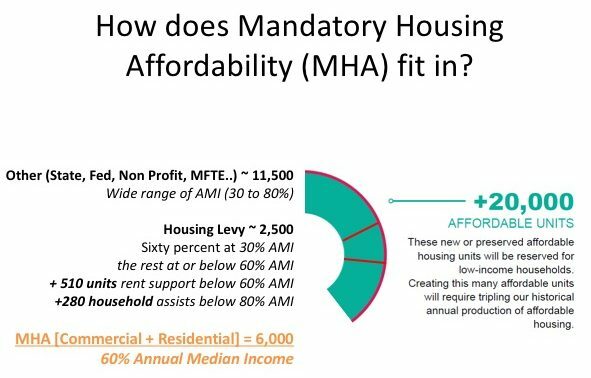 The affordable units are expected from three roughly equal sources: about 1/3 of the affordable units would be funded by new commercial fee (e.g. 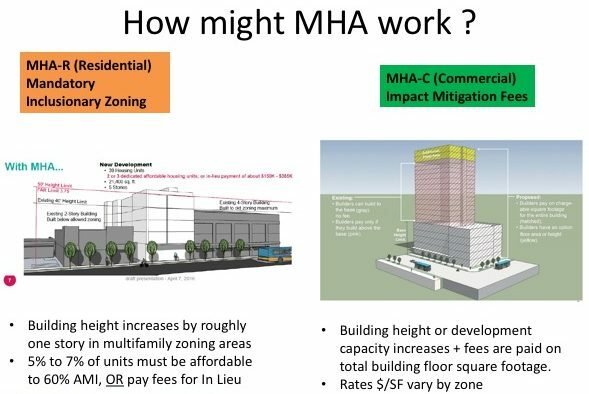 non-residential buildings); 1/3 would be funded through fees paid by residential developers in lieu of providing housing onsite; the 1/3 (gray box) represents onsite construction . 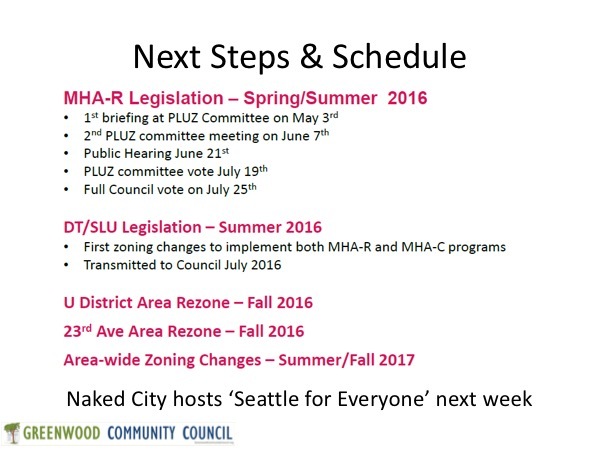 To reach the total, City would use leveraged funding from other sources. For both residential and commercial programs, the requirement for fees or in the case of residential buildings set-aside affordable units would be offset by additional allowable capacity (height or bulk). 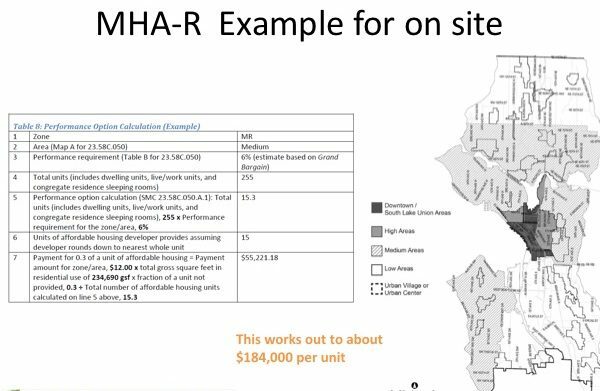 This may make the property more valuable for existing owners, and allows for more revenue to offset the developers cost of providing affordable housing. 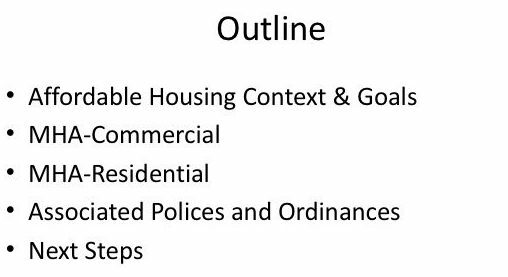 Here are some examples of where new affordable units would likely be located, first for on-site units, and second for buildings that are built by the city using fee revenue from developers who don’t choose to include affordable units in the buildings they construct. 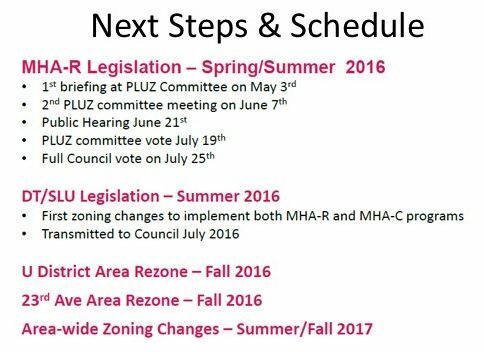 Note that none of the MHA residential numbers have been worked out or finalized. 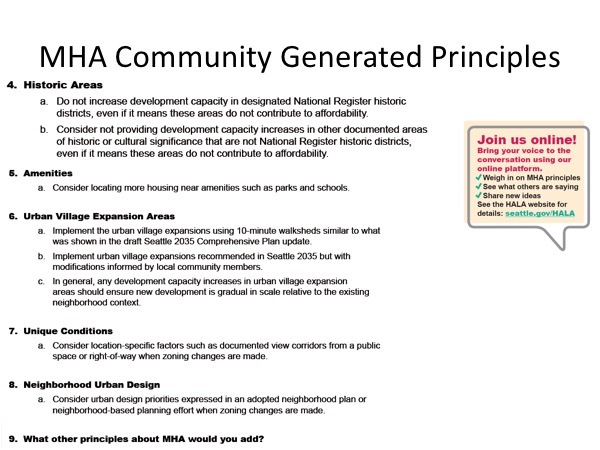 There are many other HALA-related policies and proposed ordinances being considered. 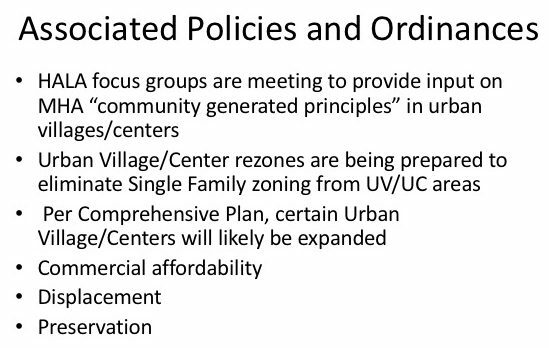 At the same time focus groups are meeting to provide input on proposed zoning changes and (in theory) similar outreach will occur at some point through existing neighborhood groups.